London, ON: Brick Books, c2015. 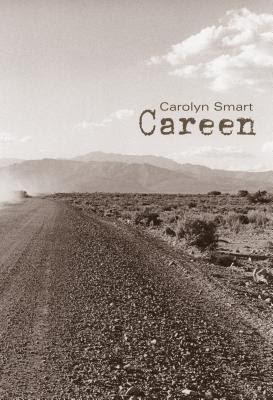 I first read Carolyn Smart's poetry when I discovered her collection Hooked, courtesy of the publisher, a few years ago. It features 7 women, all outsiders of some sort, telling their stories in their own voices. Clearly, Smart wasn't done with outlaws, as this book is a multifaceted approach to the tale of Bonnie & Clyde, told in many voices, from the main characters to those of others in their gang, Clyde's brothers, their wives, mothers, neighbours, and a lawman hunting them down. It also shares media stories, and how the newspapers got things wrong in their rush to create legends out of these two. Nothing too relevant, right? I felt like I knew a fair amount about the mythology of Bonnie & Clyde before I read this book. But as I went through it, hearing many angles and details I never knew, I realized most of what I knew came from the movies. And as W.D. Jones says in one of his poems, "That damn fool movie made it look so fine, / like it was sorta glamorous, our ride, but it was hell." There is constant violence, longing, and hardscrabble living in these poems. It's a time when disaffected youth took to the road in the face of poverty and no other options for their lives. When angst and anger and weariness wore down so many families, and the lack of a future made them reckless. When the open road promised something, a kind of freedom, even if was predicated on complete alienation from social norms. until one night it did. all I wanted from a life, to claw our way to where we aimed to be. I found these poems both beautifully written and very touching -- somehow completely emotionally engaging without romanticizing or sentimentalizing this criminal life. It was a book that caught me and made me keep reading to find out what happened to everyone, even while wanting to avert my eyes knowing it wouldn't end well. And for the month of February (2017) only, Brick Books is having a $10 special on 10 specially selected reads -- and Careen is one of them! A great chance to pick it up and check out Brick Books' lovely production values as well. The storytelling and raw voices in this book remind me of a couple of other reads -- both the verse novels of Ellen Hopkins, all dealing with life on the grittier side, and the great Stefan Zweig's The Post Office Girl, a story of a girl stifled by poverty and lack of a future who meets up with just the right/wrong man at the right/wrong time. This work is completely new to me. It sounds like a truly remarkable collection, gritty, moody, honest, and beautiful. Excellent review. Oh, it is so good. She uses poetry to its full advantage to tell these people's stories. Really powerful stuff.